When we arrived there was a blackout in the whole village, and the staff were prepared (with candles) and took good care of us. The room we had was on the corner and had an excellent view. We loved that this hotel was in the quiet part of town (next to inkaterra) rather than on the noisy and touristy main strip. 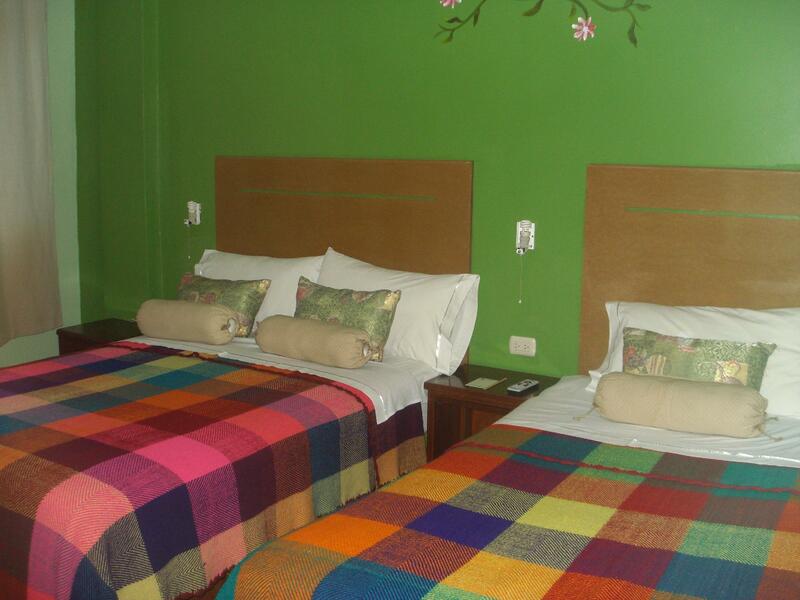 The hotel's location is good, it's just next to the train station and handicraft market. 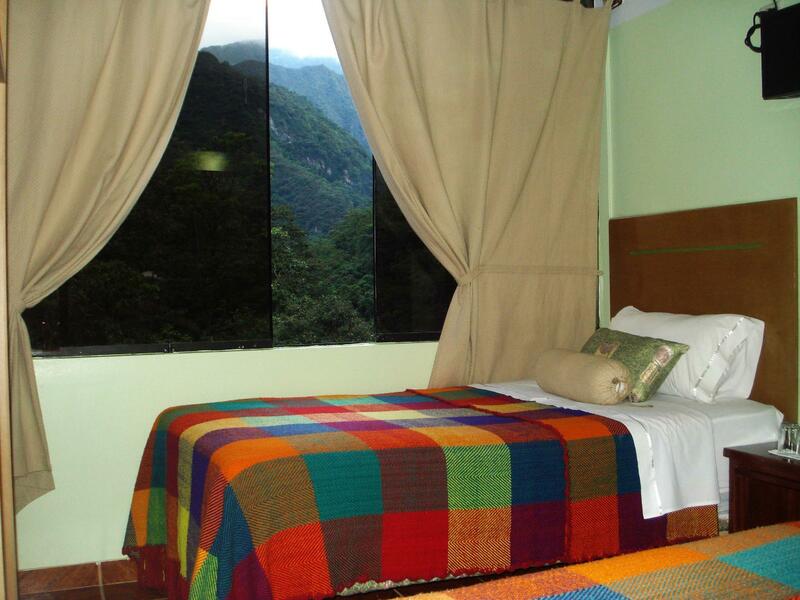 As the town of Aguas Calientes is small, every hotel in town is just a short walk to the town centre and restaurant row. Room is generally clean and spaceous. Bed and linen are comfortable. Bathroom is huge and has a jacuzzi. Tried using it once but it just made too much noice that I am worried that the room below will absorb the noise as well. Wi-fi is free and has strong signal. TV has only one cable channel and in Spanish. My room was at level 3 and having no elevator is a letdown. Breakfast included in room rate does not have many choices. I came down one time at 8AM and what was left are cereals and bread. Eggs, sausages and fruit juices were not replenished so I decided to skip breakfast. At one morning, there were tiny bigs inside the room when I woke up probably because a small window (like an exhaust opening) was open throughout the night. One morning, there was no cold water at around 5AM, only hot water. I have to contend with hot water in shower, only to find out during breakfast when I complained that the staff forgot to turn on the cold water line. Great stay and good value. This is not a luxury hotel. 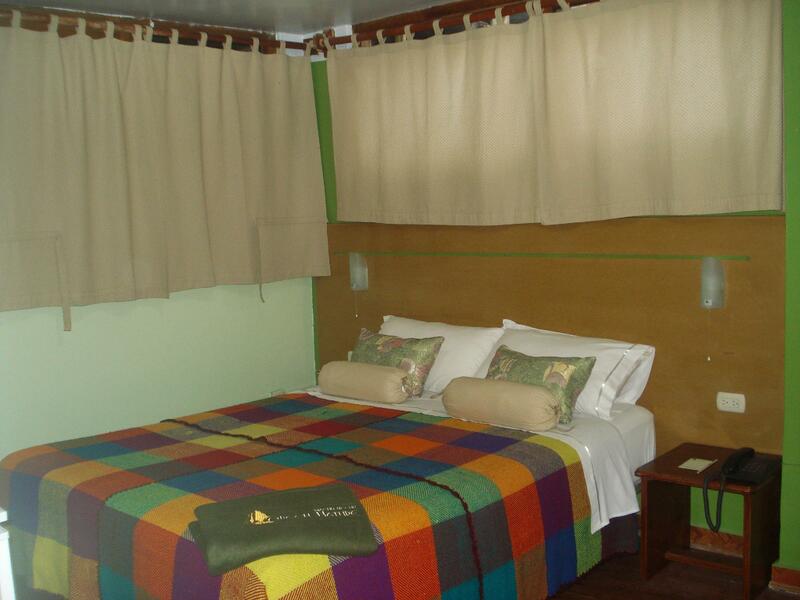 The purpose of staying here is to get to the main attraction, Machu Picchu. i like this hotel as budget friendly and yet clean and cozy. i love this place. breakfast was nice and served early enough to have before going to machu picchu, which you need to go early depending on your ticket type. the only one and big concern was that the windows of my room facing street had no locks. i felt unsecure as my room was 2nd floor and the street was a slope and anyone could reach the window. after all, it is a very small town with low crime rate, and at night time a policeman stood where he could see my room, so i had no trouble. (i kept valuable goods in a locked bag, and chained the bag with a leg of the bed, though.) i would go back to this hotel next as well but will chose other rooms. Overall, I like to stay in this hotel. Easy to get everywhere, and the hotel staff was helpful to show directions, etc. The room is modest, but bed is good.The breakfast was great, good combination of warm meal, fruits, juices, bread, coffee-tea. And it has hot water. The brochure shows small garden, unfortunately, the only greenery is the color of the wall. Due to poor planning on my part with the Peru Rail tickets, I had originally booked a room for 2 for 2 nights and had to change it to 1 night. Since it was too late to cancel, the staff was nice enough to let me get 2 rooms for 1 night. The room I had, had a great view. The only downside is that the windows are thin. You can hear all the trains coming in and construction going on (which was constant). There is no elevator, so be prepared to walk up a long winding staircase. I ended up being at the top so it was quite a walk...especially when you got the the ground floor and forgot something! Other than that, the hotel was nice and clean. The staff was friendly and spoke enough English for what I needed. I'm peruvian and Ive been to Machu Picchu about 9 times in my life. I live in NY now so I wanted to take my husband to see the ruins and I had no way to get the regular hotel wher eI stay in, since it was booked already. I found Green Nature on this site and since I had good experiences with Agoda I went ahead and booked. I knew it was going to be a bit far from the plaza and the main areas, but I had no idea it was THAT far. The area (Urb. Las Orquideas) is definitely not my favorite, since you do have to walk a lot to get there and its a bit dark and loud with the train station being right there. I don't mind the trains at all, but I DO mind the insane noise the guests make in the hotel. I have no idea what kind of people cant shut their kids up at 1am! The hotel desk wouldn't ask them to keep it down. The room was insanely cold because the window (which faced the air duct) wouldn't close and all the rooms in that part of the hotel (the back) shared that same duct. It became a sound tunnel and I could even hear people using the restroom in their hotel rooms. The floors were slippery and felt dirty and the bed covers are disgusting. I found all kinds of hairs all over them. I was disgusted to sleep there. the bathrooms are soooooo badly made that your knees touch the wall even if, like me, you are 5'2"! The shower drain would not work correctly so we ended up in a pool! 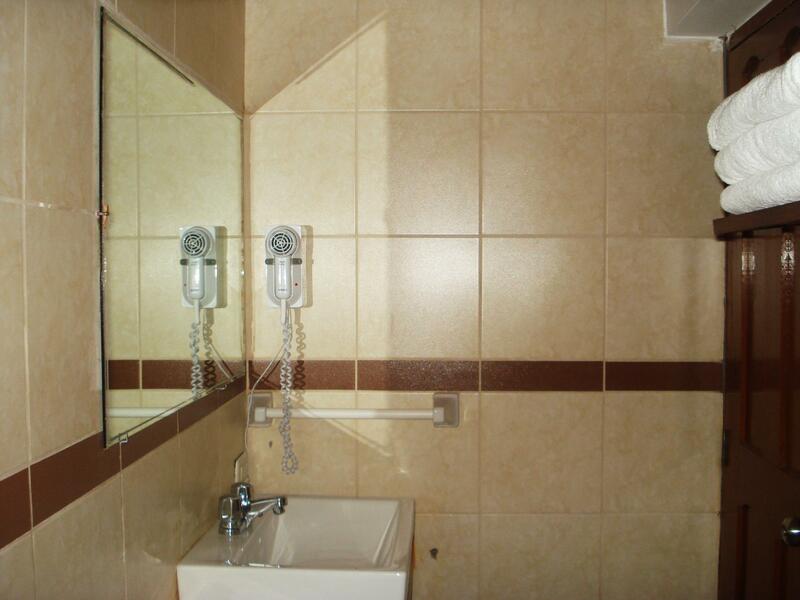 The shower doors were awful and let all the water into the floor. When I asked for more towels they said they could not provide me with that. The only good thing was the breakfast. Decent for the price and early. 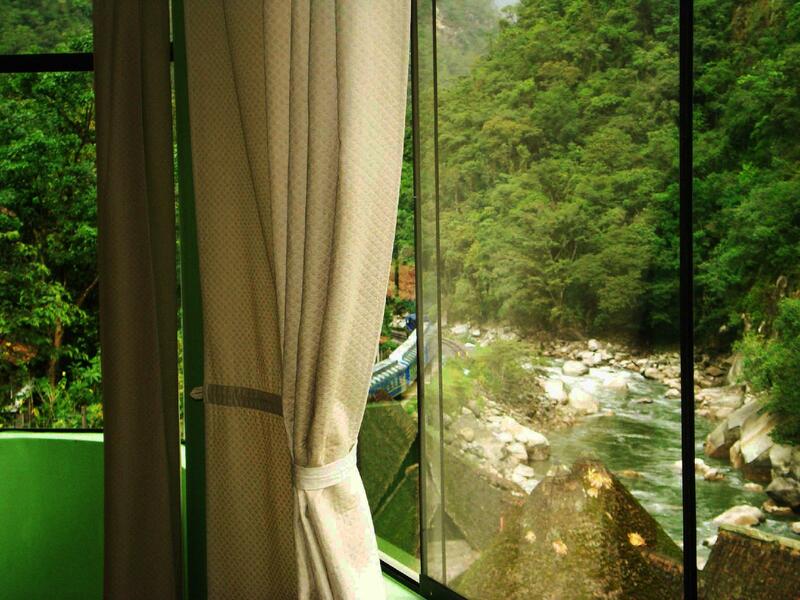 There are too many options in Aguas Calientes to settle for this. Nice breakfast, free wifi, and a pretty convenient location near the train station. It's about 5 minutes of walking distance from the main haul of Machu Picchu Pueblo. Hotel staff is friendly and helpful. Sometimes I wish they were a little cleaner and more attentive to replenishing soap, etc. but those are minor points. Great value! The hotel was in a great location. The staff was helpful in their suggestions of what to do in the town. There was a computer available for use in the lobby, the Wifi did not work great in our room which was on the top floor. The beds were fine, the breakfast was ok. Nothing to rave or complain about too much, think it was probably one of the better hotels in a town with not many good ones! nice room for the price. however on the second night of our stay a diesel engine from the train station, which is in front of the hotel, ran all night. the reason you stay in aguas clients is so you can be up at 4am to catch the first bus and engines humming don't allow for a good rest. Rooms are very nice. Location is good. The rooms were very nice, a little spartan, but colorful. The staff downstairs was not very helpful or friendly. Breakfast was pretty good. Maybe a bit overpriced in light of the fact that service was lacking. unfortunately the staff seemed to be overworked and it showed while we were there. the front desk guy was probably nice but was working from 4am until late at night.